Andhra Bank is a public sector bank found in the year 1923 by Dr. Bhogaraju Pattabhi Sitaramayya, a well- known freedom fighter. The bank was started with a paid up capital of 1 lakh and authorized capital of 10 lakhs. The bank has more than 2800 network of branches and over 3600 ATMs. Andhra Bank is the first Indian bank to launch biometric ATM’s where in you need to give and input of your fingerprint instead of entering the PIN number (Personal identification number). The Andhra Bank provides numerous services to its customers. Along with the exclusive range of services they also provide AB premium current account and AB privilege corporate salary savings bank account with lots of benefits. Andhra Bank works hard to provide excellent customer satisfaction and provide full range of banking services in an innovative way and increase stake holders values. They provide numerous services like Retails banking, agricultural purposes and NRI’s. The retail banking includes offering Loans, Accounts and deposits, MSME, demat Accounts, debit cards, credit card and more. Andhra Bank aims at excellent customer service and they are always ready to address the customer queries very quickly. Most of the queries can be get solved through inline itself so that the customers work gets really easy and there is no need for them to visit the branch often. Their online services include applying for debit and credit card online, phone banking, SMS Banking, Account opening, internet banking, blocking debit cards and many more. Internet banking is one big facility that provide many services and makes the work easier for the customers. You can pay bill online using internet banking and get to know about various other services. There are details given below about the internet banking and how to use it. Andhra Bank Internet Banking Login Online - How to start Using Internet banking in Andhra Bank? 1. If you are already registered with Andhra bank Internet banking facility visit this website https://www.onlineandhrabank.net.in/. 2. Choose the type of banking, if you are a retail customer then click on Retail User Login. You will be directed to a disclaimer page, read the disclaimer carefully and click on “Proceed”. A new window will get opened displaying the 'Disclaimer' information with a Continue button. Click on the Continue button to proceed. 3. Enter the User id and password, then click on “Submit”. You will be able to use the internet banking services. Options available in the Andhra bank online banking page. Even if you get a call from someone telling that he/she is from Andhra bank, do not share this information like user id and password. Bank will never ask your user id and password at any cost. Also do not send user id and password through mail to anyone. Even if you get any mail asking for your Andhra bank user id and password from anyone claiming that he or she is from Andhra bank, do not provide your user id and password. Bank will never ask your user id and password at any cost even through mail. If you get such a mail, it is called as phishing mail. Report such incidents to Andhra bank immediately. 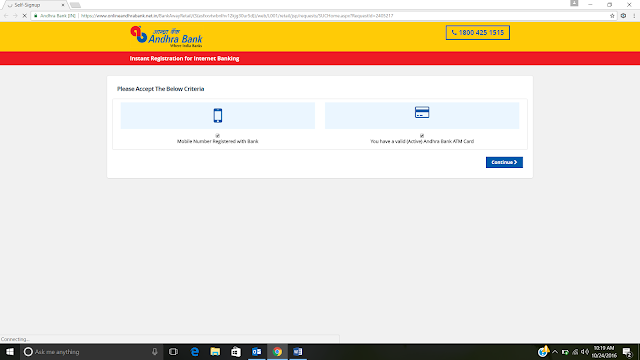 If you are a new user then follow the below steps to register for Andhra bank online banking in online. 1. Visit this website http://www.andhrabank.in/English/home.aspx. 2. Click on the link 'Internet Banking Signup' link. 3. A new window will get opened. 4. Click on the “Mobile number registered with the bank” and “You have a valid (Active) Andhra Bank ATM card” check box and click on “Continue”. You should have both the details, such as the registered mobile number and the debit card number, only then you will be able to proceed. 5. Now enter the customer ID and the IB profile (View & transaction or View Only) click on proceed. The View Only option helps you to view your bank account profile , The view & Transaction will make you do online transactions using internet banking. 6. Now confirm the mobile number. A one-time password will be sent to your mobile (OTP), enter that OTP and validate your registration. 7. You will be getting your registration status. You will be receiving your Username and Password for internet banking sign in soon. 8. Once you are registered with the internet banking you will be able to do finds transfer, view your account summary, pay credit card bills, using net banking for other online transactions and many more. 1. Visit the website link https://www.onlineandhrabank.net.in/AB_Internet_Banking_facilities_forms_download_home_page%20.htm. 2. Click on the link ' AB Internet Banking Application Form'. A new form will be opened in a new window. You have to enter the below fields in the form and submit in the bank. Address for communication including door number, street/locality, city, district/state and pin code. Phone number - Mobile number and Landline number. Martial status - single or married. Date of marriage which is an optional field. Status of Applicant - Resident Indian, Non Resident Indian, Foreigner. Facility Required - View only, View and Tax Payment, 3rd Party Fund transfer. After entering the required fields, enter the date and place and Sign the form in the required fields. You will get an acknowledgement slip which is signed by the officer/manager. In the application section, you find even the below application forms. Hope this article would have given you good information about Andhra Bank and its facilities, online services of Andhra Bank and how to register for Internet banking in Andhra bank.